(Preface): On July 18, 1863 Union Gen. Edward E. Potter led infantry and cavalry from New Bern to destroy the Wilmington and Weldon Railroad bridge at Rocky Mount. The infantry feinted toward Kinston and retreated to New Bern. Potter raided Greenville, then sent part of his cavalry to Rocky Mount and occupied Tarboro. The raiders damaged or destroyed bridges, trains, munitions, and mills before returning to New Bern on July 23, but the Confederates restored rail service by Aug. 1. [and] quartermaster's subsistence, and ordinance stores." Soldiers plundered private homes, the Masonic Lodge, the Bank of Tarboro, and other businesses for valuables. The Federals marched south in the evening back through Sparta toward New Bern after the engagement at Daniel's Schoolhouse a few miles east of here. They set the Tar River bridge afire behind them, but townspeople extinguished it before it sustained extensive damage. 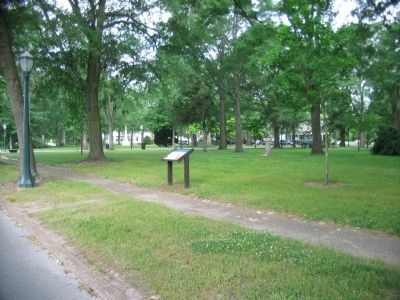 The historic town common was laid out when Tarboro was incorporated in 1760. During the Civil War, two Confederate hospitals stood here in the old Male and Female Academies, as well as a Confederate prison stockade for Union soldiers captured at the Battle of Plymouth in April 1864. The Wyatt Fountain here was erected after the war in honor of Pvt. Henry Lawson Wyatt, a Tarboro resident. Killed at the Battle of Big Bethel on June 10, 1861, he became the first North Carolinian known to have died in battle during the war. Street, on the left when traveling east. Touch for map. Located in the town commons. Marker is in this post office area: Tarboro NC 27886, United States of America. Touch for directions. Other nearby markers. At least 8 other markers are within walking distance of this marker. Edgecombe County Confederate Memorial (within shouting distance of this marker); Town Common (within shouting distance of this marker); Washington's Southern Tour (within shouting distance of this marker); U.S.S. Maine Memorial (about 300 feet away, measured in a direct line); John C. Dancy (approx. 0.2 miles away); Henry T. Clark (approx. 0.2 miles away); John Spencer Bassett (approx. 0.2 miles away); W.D. Pender (approx. 0.2 miles away). Touch for a list and map of all markers in Tarboro. More about this marker. On the lower left is a photo of the Civil War-era Edgecombe Courthouse, demolished 1963. 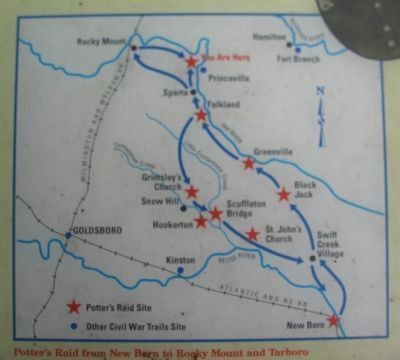 In the lower center is a map of Potter's Raid from New Bern to Rocky Mount and Tarboro. Above the map is a portrait of Gen. Potter. In the sidebar is a portrait of Henry Lawson Wyatt. Related marker. Click here for another marker that is related to this marker. Memorial at the site where Private Wyatt was killed. More. 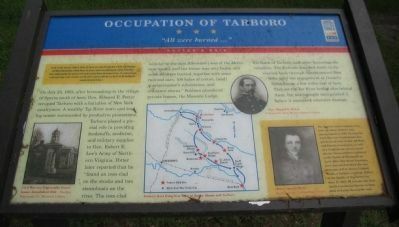 Search the internet for Occupation of Tarboro. Credits. This page was last revised on June 16, 2016. This page originally submitted on May 23, 2010, by Craig Swain of Leesburg, Virginia. This page has been viewed 1,071 times since then and 7 times this year. Photos: 1, 2, 3. submitted on May 23, 2010, by Craig Swain of Leesburg, Virginia.